Rotary Club of Cleckheaton & District - Welcome! 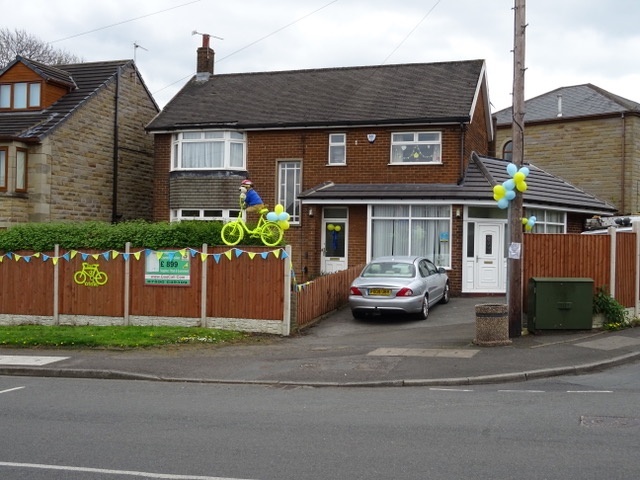 The club worked with the Spenborough Chamber of Commerce and the Civic Society to create a memorable day when the 3rd stage of the Tour passed through the centre of Cleckheaton. 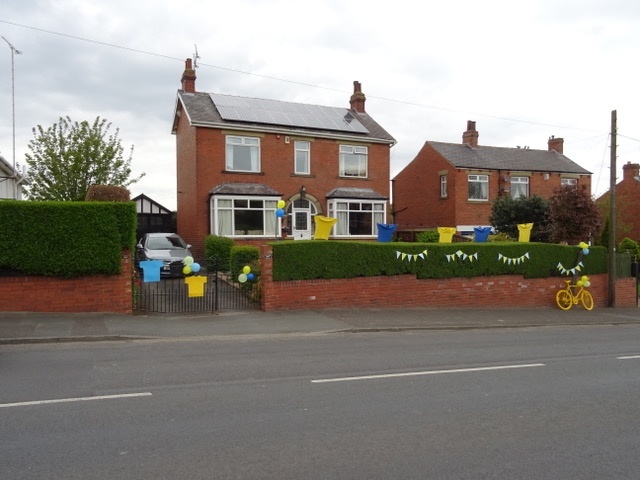 Posters were printed and distplayed, leaflets distributed encouraging people to decorate their premises and bikes were painted yellow and blue and positioned in strategic places along the route. Prixes for the best decorated houses (winners shown below) were awarded and took the form of vouchers that could be spent in retail members of the Chamber of Commerce. 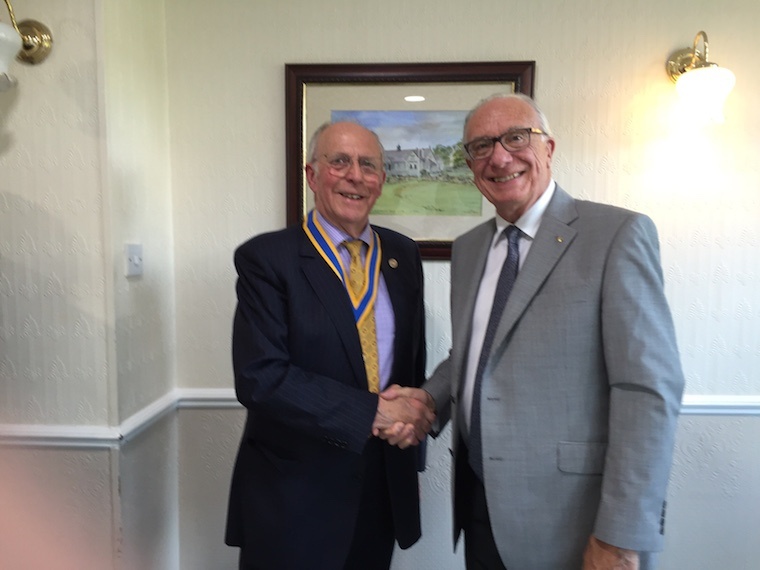 The attached picture was taken when retiring President David Laycock of Cleckheaton Rotary Club handed over the office to incoming President David Sugden of Wyke on the 29th June. 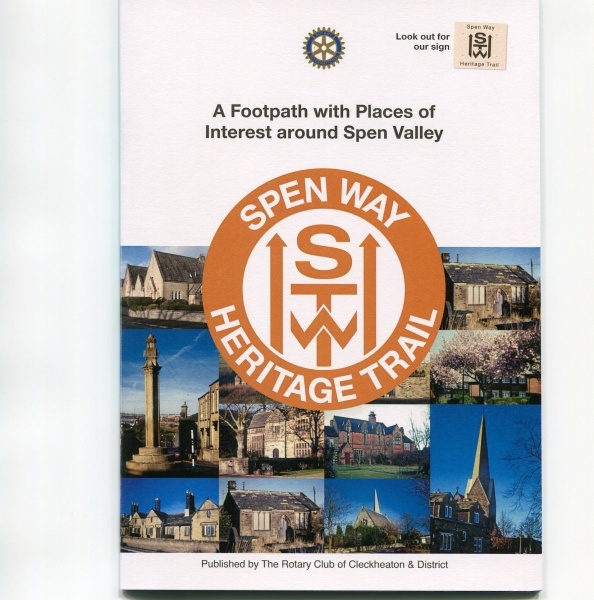 The New President set out his aims as continuing the service to the Community in Cleckheaton and Spen Valley with an emphasis on the work done with Young People and supporting local projects such as the recent Bronte Heritage Walk that raised over Â£3,000 for local charities. On the international front the Club’s support of the Polio Eradication programme conducted jointly by Rotary International and The World Health Organisation will continue along with such projects as Vision Aid Overseas for which the Club has collected over 100,000 pairs used spectacles over the past 20 years. A further basic aim is to build membership of the club as the average age is climbing and new younger members are to be encouraged. Towards this latter aim the Club is to hold an open evening on the 21st September at Cleckheaton Golf Club when the activities will be explained. Our sponsored walk on the 22nd May, organised as part of the Bronte Anniversary celebrations has raised over Â£3,000 for local charities. Walkers were invited to take part by the Club to raise funds for a charity of their choice and the event itself was sponsored through the Club by local businesses. Charities that will benefit from money raised include the Fan Woods Campsite, Spen Civic Society, Bradford Diocese Youth Exchange Programme and Rotary Charities. The points of interest on the trail emphasise the local connections with the Bronte family, the Luddites and many of the notable local families. On Tuesday the 1st March the Inner 9 Group of Rotary clubs held their annual Technology Tournament at the Frontier Club in Batley when 31 teams from 12 local schools worked against the clock to build a “Pipeline Vehicle”. The teams compete in 3 classes; Foundation (12/14 year old), Intermediate (14/16 years) and Advanced (over 16) and the brief given to each group follows a similar pattern but with increasing complexity. Each team is provided with a quantity of materials such as timber strips, card, string, electric cable, an electric motor and batteries, wheels and pulleys. From these materials the teams had to design and build a vehicle that will clear debris blocking a pipe. In real life such vehicles operate regulrly in gas and water pipelines and are known as “pigs”. The Rotary clubs provide judges who mark the teams on design, build quality, team work and organisation with, of course the most points going to a successful final test of the vehicle against a defined time. The winners this year in the Foundation class were Ossett Academy who scored 87 out of 100, at Intermediate level it was St John Fisher School with an excellent 92/100 and at Advanced level Mirfield Free Grammar, with 85 out of 100. Chief Judge David Sugden commented on the ingenuity shown in the designs offered and hoped the Tournament will encourage students to move into practical apprenticeships where the skills demonstrated on the day can be put into practice. Chairman of the Tournament Mike Gill of Horbury Rotary Club thanked the Dewsbury and Batley area committees for their support of the event, the schools for their participation, all the Rotarians and friends of Rotary who worked to prepare the event and act as stewards or judges and most importantly Deputy Major Jim Dobbs for attending and presenting the Trophies. Councillor Dobbs congratulated the teams on the workmanship and skills demonstrated and the schools for taking part. He thanked the Inner 9 Group of Rotary Clubs for organising such an interesting and constructive event. October 24th was the 30th anniversary of the start of Rotary’s “End Polio Now” campaign. Carlos Cansecco, then President of Rotary International, launched the whole programme on that date in 1985. The original programme used the Sabin Vaccination method. Now an oral method is used. Since the launch by Rotary International the World Health Organisation, UNICEF and most recently the Gates Foundation have supported the programme. Over the 30 years Rotary Clubs around the world have contributed over $1.3 billion to the programme enabling the number of countries where the disease was endemic to be reduced from around 150 to just 2 countries at present with most recently the continent of Africa being declared polio free following eradication in Nigeria. To mark the anniversary children from Howard Park School and St Mary’s School each planted 1000 purple crocus bulbs. Purple is chosen because children in developing countries dip their little finger in purple dye to show they have been vaccinated. Howard Park added the bulbs to the other 4000 in the grass bank at the corner of the memorial park by the traffic lights in Cleckheaton whilst the children at St Maty’s school planed the bulbs in the gardens of their school.